The Environmental Protection Agency has finalized state-specific limits on greenhouse gas emissions from the power sector. States can get most, if not all, of the emission savings they need by reducing the amount of electricity they are currently wasting. 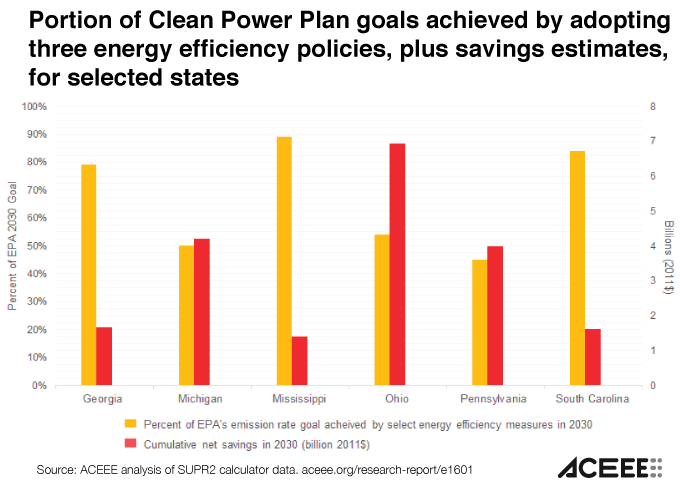 In the graph below, the light orange bars show that the listed states can achieve more than half of EPA’s 2030 limits with a few modest energy efficiency measures: 1% annual savings target, updated building codes, and 100 MW of new combined heat and power. The red bar shows the money saved by businesses and households when they spend less on their utility bills. In every single case, implementing efficiency measures costs LESS than building new generation to meet demand. All of this data comes from the SUPR2 calculator for states. It’s really easy to use. Try it out! For more information on energy efficiency and the Clean Power Plan, visit our Clean Power Plan topic page.